As we discussed earlier matching different yeast to the gluconbacteria would no doubt result in different flavor profiles. That of course is a different animal. Most (if not all) suitable kombucha yeasts are considered spoilage yeasts to the normal fermenting world. Spoilage may be more associated with such descriptions as “horsey smell” “barnyard odor”, “sour-spoiled taste”. Consider Torulaspora Delbrueckii, found in many but not all kombucha. This is a aerobic yeasts whose character is associated with German-style wheat beers and banana, clove like aroma. This may not be your favorite character but T. Delbrueckii yeasts does offer critical functionality to produce reliable bottled non-alcohol kombucha tea. The chart below shows the comparison between Torulaspora delbrueckii and the most popular brewing yeast - Saccharomyces cerevisiae. This chart graphs the progression of a typical alcohol fermentation. 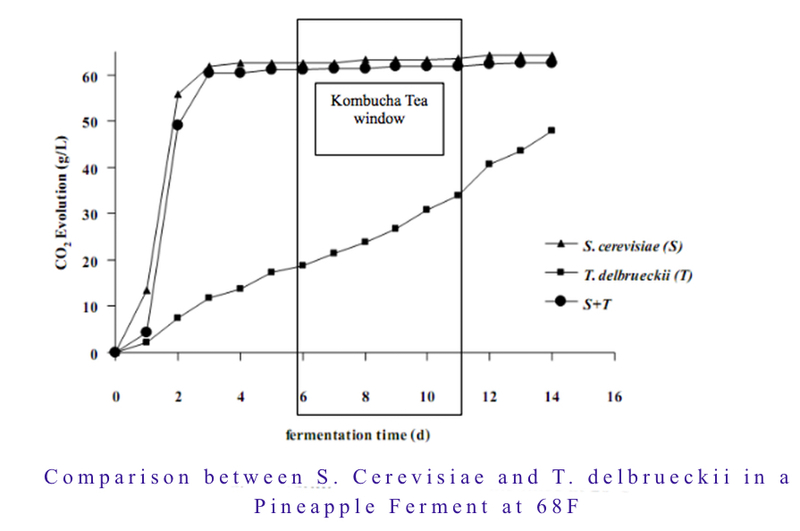 For kombucha brewing T. Delbrueckii produces significantly less alcohol (5.4%) and does not peak until 14 days. While S. cerevisiae produces 8.4% within 3 days. T. delbrueckii is clearly slow and sluggish. This is what we are looking to produce non alcohol Kombucha Tea. A 14 day to peak time gives time to hyper the gluconbacteria early while providing a larger window for shutting down the ferment (both bacteria and yeasts) via the Cluster Effect. (oxygen deprivation) where pre-determined levels may be reached. What is not shown is the affect that the co-fermenter gluconobacter - unique bacteria that converts alcohol to the beneficial acetic acid and gluconic acid is actively at work reducing the alcohol to low levels. Gluconbacteria may convert at almost a 1:1 ratio. That is converting all the alcohol to acetic acid given enough time and conditions and one's taste tolerance. Acetic acid is ~ vinegar. A Kombucha Ferment properly fermented exposed to the air results in typically less than 1% alcohol and most often below the 0.05% threshold determined to be non-alcohol. Most of the alcohol related "fears" for the kombucha drinker is when kombucha is bottled. Bottled the gluconbacteria is deprived of oxygen and ceases to convert alcohol to acetic acid. (unless kept refrigerated). That is with almost any other yeasts than T. delbrueckii. T. delbrueckii is a unique aerobic yeasts that only produces alcohol in the presence of oxygen. Just like its bacteria counterpart (gluconobacter) oxygen is needed to ferment. Without oxygen (such as when bottled) fermentation ceases. Generally yeast produce more alcohol in anaerobic conditions (without oxygen/ when bottled). In a kombucha ferment most of the alcohol is produced in the first few days. The second half of the ferment is where the gluconobacter convert the alcohol to beneficial acids. This occurs only in the presence of oxygen and in temperatures over 72F. In the kombucha ferment this is noticeable by the transition from a sweet tea to a slightly sour, slightly sweet tea and by the appearance of the kombucha SCOBY or mushroom that forms by the gluconobacter. To keep alcohol to the very minimum, keep the brewing temperature above 72F (74 to 84F is our recommended range) and as sour as you can pleasantly tolerate, and then refrigerate and keep refrigerated until ready to drink. Or be sure to use Torulaspora Delbrueckii as your kombucha yeast. Another method of keeping your alcohol levels as low as possible is to ferment in OAK BARELS. Oak performs two functions. First the wood absorbs a small amount of alcohol and secondly the wood charcoal absorbs the more toxic methanol compound of alcohol. This leaves a mellow smooth taste with far less bite. 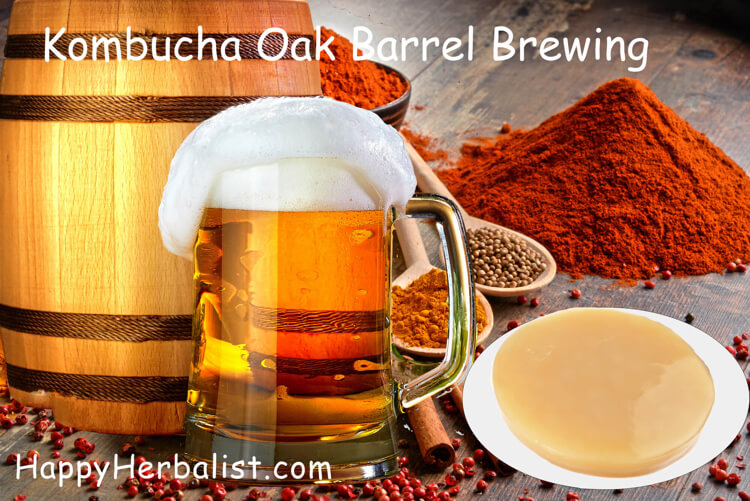 Many kombucha tea folks want low alcohol but they miss the carbonation. Resorting to a Second Stage Ferment, or simply leaving the bottled kombucha tea at room temperature will increase the carbonation - but also increase the alcohol levels (as the gluconobacter are shut down). The simplest method is by adding a 1/4 teaspoon of calcium carbonate, potassium or magnesium or even baking soda. Any of these beneficial minerals will neutralize a small amount of the acids in kombucha tea. The result is carbonation. This does affect the taste so be careful not to add to much and just prior to drinking. Legally anything over 0.5% is considered alcohol.